Hide the system pointer is a reasonable option for presentations for example in Microsoft Power-Point. When the option "Hide system mouse pointer" is activated, the default mouse pointer or cursor will be not displayed (hide, disable, shielded, faded out)! E.G: Hide the default mouse pointer when show the pointer stick! (Image-1) Hide system mouse pointer feature for windows! 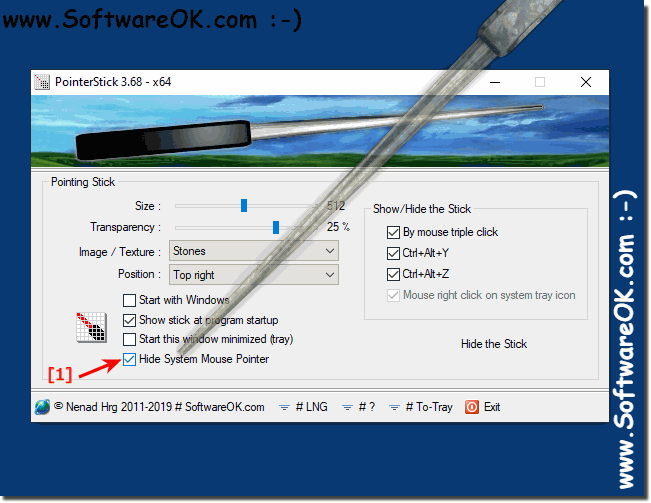 PointerStick - FAQ-3: What does the hide system mouse pointer feature?